This ’67 Camaro RS went from rust bucket to show-stopper, in twenty-five years flat. It all began with a phone call from my friend Dave. He wanted to talk about the possibility of restoring a 1967 Camaro RS convertible for a family friend of his. His friend, Karl Becker, had purchased a well-used, but original, ’67 Camaro RS convertible from a retired airline pilot in Miami. The car ran, but needed a total ground-up restoration. I told him to have Karl bring the car by my shop so we could see what we were up against. On first glance, the RS didn’t look that bad. Digging further however, revealed that although it was all there, everything would have to be replaced or rebuilt. We agreed on an initial price and date to start the project. That was in January of 1991. Karl dropped the car off in March and Dave and I started the initial teardown. To our dismay, it was a lot worse than we first thought. We learned that the Camaro had spent most of its life in Connecticut, not Miami. The airline pilot had only retired to Miami a couple of years before he sold the car to Karl. Most of its life was spent in the Northeast rusting away season by season, since this car was the only transportation the airline pilot had at the time. And when the rust repairs were made, they were shoddy at best. When we pulled the carpet back, we found a Plaid Stamps sign riveted to the driver’s side floorboard, and a piece of ½’’ plywood carefully cut out to fit the floor on the passenger’s side. It was held in with roofing tar. If that wasn’t bad enough, the doors had to be lifted to catch the strikers on the B pillar. I thought it was because we had a floor jack under the subframe, but came to find out the hinge pins and bushings were not the only culprit; the entire cowl was flexing backward when we had the car jacked up. Once we put the car on the ground, the doors closed better. But there wasn’t enough of structural integrity left in the floor to support the firewall area. Then came the surprise of the front subframe. Dave and I decided to lift the body away and roll the subframe with the motor and transmission still in it. That way, we could start to clean the 20 years of grease and grime off the motor and transmission while it was still attached to the subframe. We enlisted the help of my then 12 year old son, Matt, to do the grunt work of the cleaning process. We removed the front clip and went to jack up and support the body so we could remove the large body-to-subframe bolts, but we didn’t have to go through all that work. The subframe had rusted around each body bolt, allowing it to just fall off the body without removing the bolts. There was really nothing holding the front end to the rest of the car! Dave, Matt and I could only work this project on the weekends. Matt was in school, I owned my own auto parts store, and Dave had a full time job at the Kennedy Space Center. It took us an entire month to strip the car down so that we could get a clear picture of the extent of the work necessary to restore the Camaro. After we removed everything we possibly could, we gave Karl a shopping list of parts to find so that we could start the rebuilding process. We started with the floors and worked our way up and out. Karl had his work cut out for him, but came through with everything we initially needed. You have to remember that this was 1992, so restoration parts were few and far between, even for Camaros. Karl wheeled and dealed at the local Chevy dealership and bought the front inner and outer fenders, rear quarters, inner and outer rear wheel tubs, rear trunk floor, deck lid, rear tail lamp panel and front hood upper valance from them. This Camaro’s rebuild was unique, since all of the aforementioned parts were GM genuine stampings. The only sheet metal that wasn’t available were the floorpans, but lucky for us, they were just starting to be reproduced in the aftermarket. My brother Gordon and I owned our auto parts store, and Gordon ran the machine shop on premises. 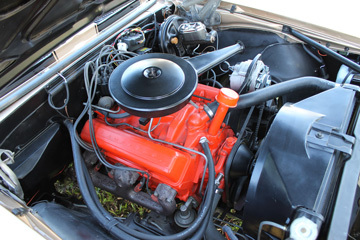 So, Gordon rebuilt the Camaro’s 327 V8 engine, resealed the Powerglide transmission and rebuilt the differential to factory specs. Now that the large drivetrain components were rebuilt, we moved on to start the final bodywork aspect of the restoration. But time, money, and priorities all have a way of changing, and the Camaro was the one that suffered. It sat in a corner of my shop for 12 years before we got serious about finishing the project. Karl infused some much-needed finances, and I enlisted the help of friend Kevin Harlinski for the body work chores. Kevin also took on the job of wiring the entire car with new harnesses. He and I finished the bodywork and I finally painted it. Karl didn’t want to paint the Camaro the original shade of gold, so we chose a later model GM truck gold. He also wanted the Z/28 rally stripes in black, which really complements the gold paint. 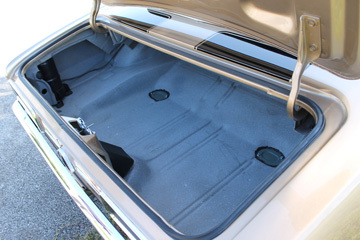 We had a new black convertible top installed by Ron at Corvette Interiors Plus. 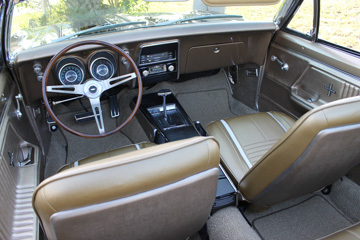 Early in 2015, my son Matt (who is now married and has a family of his own), Gordon, my friends Ed Grimes and Bob Smith, and I tackled the final area of the car to be restored – the interior. It was around Labor Day weekend, 2015 that the Camaro keys were handed off to Karl, nearly 25 years after we started the project! Karl, we hope you enjoy the Camaro, it’s been a long time coming!